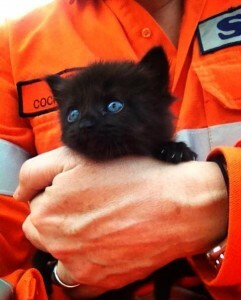 On Friday the 13th of September, one lucky little black cat was rescued by Cockburn SES. SES received a call from the RSPCA regarding a stray kitten stuck inside a wall. With some careful extrication in the kitchen, Wall-e the 5-6 week old kitten was able to walk straight out on her own accord. She was found bright, alert and responsive with minimal dehydration, despite being stuck in the wall, since the evening before. Wall-e had something to drink followed by some food and will now be looking for her fur-ever home whilst she stays at the RSPCA! There are two parties interested already, we will keep you posted as to what happens!